Firefox 62 for desktop brings support for Variable Fonts. Variable Fonts are an evolution of the OpenType font specification that enable many different variations of a typeface to be incorporated into a single file. Standard fonts usually require a separate font file for each variation, resulting in more HTTP requests, and more data being downloaded (around 20k per file). Variable Fonts contain additional data, enabling developers to access all variation contained in a given font file via CSS and a single @font-face reference. Variables Fonts are supported for Edge 17+, Firefox 62+, Chrome 69+, Chrome for Android 69+, Safari 12+, and Safari for iOS 11.4+ browsers. It is important to notice that Linux needs the latest Linux Freetype version, and macOS prior to 10.13 does not support variable fonts. Another new feature, exclusive to macOS, is that Firefox will now automatically enable the dark theme when macOS Mojave is in dark mode. Shape Path editor, a tool to help developers see and edit shapes, is now available by default. A new mode has been added to the Page Inspector, 3-Pane mode, which allows developers to see simultaneously HTML pane, CSS Rules, as well as other CSS features such as Computed styles view, Animations view, and Fonts view. Now on Grid inspector in Firefox, DevTools is available to edit grids present on a page, debug layout issues, etc. See CSS Grid Inspector: Examine grid layouts. A close button has been added to the split console toolbar. The Network Monitor's Cookies tab now shows the cookie samesite attribute (bug 1452715). Responsive design mode now works inside container tabs (bug 1306975). The Developer Toolbar/GCLI has been removed from Firefox. The WebAssembly.Global() constructor is now supported, along with global variables in WebAssembly (bug 1464656). The experimental Speech Synthesis API (Text-to-Speech), which allows developers to incorporate voice data into web apps is now enabled by default on Firefox for Android (bug 1463496). Addition of the webRequest.getSecurityInfo() API to get detailed information about the TLS connection associated with a particular request (bug 1322748). Addition of the browserSettings.newTabPosition to customize where new tabs open (bug 1344749). windowTypes has been deprecated in windows.get(), windows.getCurrent(), and windows.getLastFocused() (bug 1419132). New tab_background_separator property of the theme manifest key enables extensions to change the color of the tab separator (bug 1459455). The complete list of features, bug fixes and changes in Firefox 62 can be found in the release notes. Furthermore, there is a site compatibility guide for Firefox 62. Firefox for iOS has received some tab improvements, allowing users to search, switch and manage tabs. Now it is possible to manage tab settings in a single view. Furthermore, users will be able to search their open tabs and seamlessly switch between normal and private browsing. 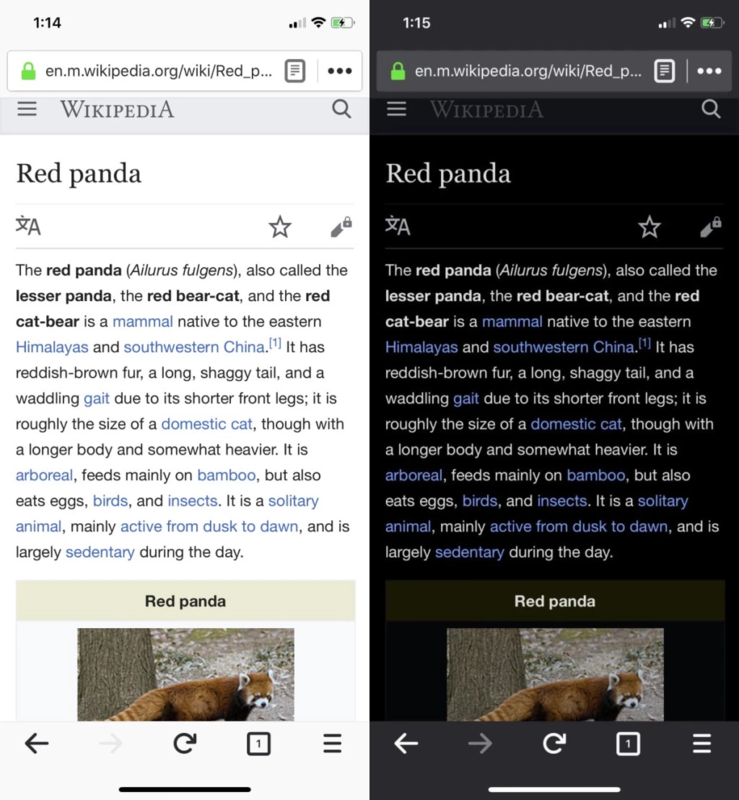 Another new feature available on Firefox for iOS is that now users can easily change the theme from dark to light, manually or automatically: to do so click on "Settings > Display > Light or Dark", or automatically turn it on by using the Automatic switch. Users who already have Firefox installed should be able to upgrade it automatically; new users can download Firefox 62 for desktop on firefox.com. Both android and iOS users can download from Google Play and Apple's App Store.